Umm, I mean bakewell. Tart that is. Co-hostesses Jasmine of Confessions of a Cardamom Addict and Annemarie of Ambrosia and Nectar challenged us with a bakewell tart for this month's Daring Bakers' recipe. The history of the bakewell tart is a bit fuzzy. According to Jasmine and Annemarie, today's version of the bakewell tart/pudding typically falls under one of two categories. The first is the "pudding" where a layer of jam is covered by an almondy pastry cream and baked in puff pastry. 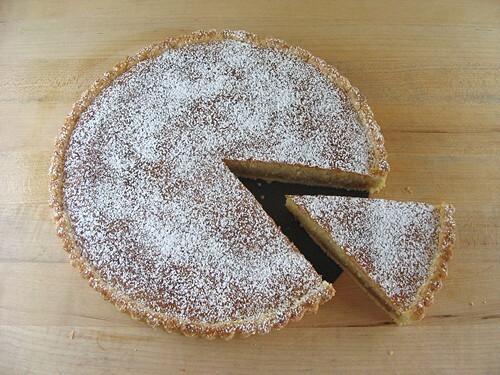 The second is the "tart" where a rich short pastry holds jam and an almondy sponge cake-like filling. The version they came up with is a combination of the two: a sweet short crust pastry, frangipane and jam. The first element was an easy to make dough for the short crust pastry. They encouraged us to put away the food processor and make the dough by hand. Grating frozen butter into the flour mimics the processing that a machine would do. My only problem was a lot of butter stuck to my box grater. I was unsuccessful in my attempts to extract every bit of butter out of the grater's teeth, so I just threw in another tablespoon of butter into the mix. Problem solved. To reduce the amount of water and increase the fat, I used heavy cream instead of water in the dough. No one said this was low fat baking! They gave us the freedom to use any flavor of jam and it could be homemade or store bought. I decided to use a mango jam given to me by a friend. And then I exercised some creative license for the final element - the frangipane filling. 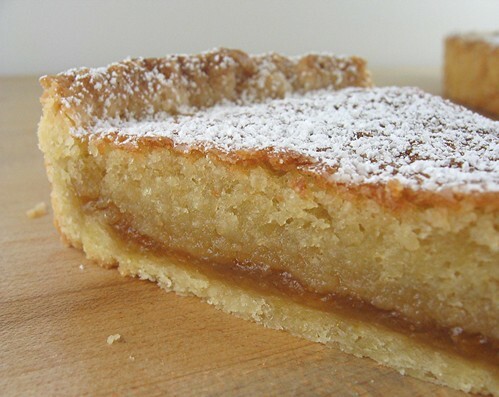 Even though I love almonds, I used macadamia nuts instead of almonds in the frangipane filling. I'm not sure if I can still call it frangipane if it doesn't have almonds. I toasted the macadamia nuts in the oven and let them cool completely before blitzing them in the food processor. I made sure to add a small amount of the confectioners' sugar from the filling recipe. The confectioners' sugar absorbs some of the oils released from the nuts and prevents the ground nuts from turning into nut butter. I also added a bit of dark rum and vanilla to the filling to round out the tropical theme. The end result was quite amazing. It was like eating a tart and cake at the same time. The cakey nut filling was divine. It was rich and moist. The perfume of the macadamia nuts paired wonderfully with the sweet mango jam. The crust was flaky and buttery, but sturdy enough to encase all the goodness of the jam and cakey filling. I could cut super thin slices and it held together beautifully which was important since I was taking slice after thin slice and eating it sans fork and plate. Remove shell from freezer, spread as even a layer as you can of jam onto the pastry base. 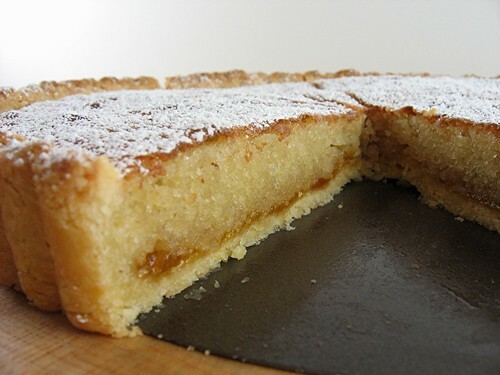 Top with frangipane, spreading to cover the entire surface of the tart. Smooth the top and pop into the oven for 30 minutes. Five minutes before the tart is done, the top will be poufy and brownish. The finished tart will have a golden crust and the frangipane will be tanned, poufy and a bit spongy-looking. Remove from the oven and cool on the counter. Serve warm, with crème fraîche, whipped cream or custard sauce if you wish. When you slice into the tart, the filling will be firm, but slightly squidgy and the crust should be crisp but not tough. Lightly beat the egg yolks with the extract (if using) and quickly mix into the flour mixture. Keep mixing while dribbling in the water or cream, only adding enough to form a cohesive and slightly sticky dough. Cream butter and sugar together for about a minute or until the mixture is light and very fluffy. Scrape down the side of the bowl and add the eggs, one at a time, beating well after each addition. The batter may appear to curdle. In the words of Douglas Adams: Don’t panic. Really. It’ll be fine. After all three are in, pour in the vanilla extract and rum and mix for about another 30 seconds and scrape down the sides again. With the beaters on, spoon in the ground nuts and the flour. Mix well. The mixture will be soft, keep its slightly curdled look (mostly from the nuts) and retain its pallid yellow color. I know what you mean about eating without a fork... that's what I did too! I just saw your tart on the DB site and it really looks beautiful. First off, your tart is stunning. 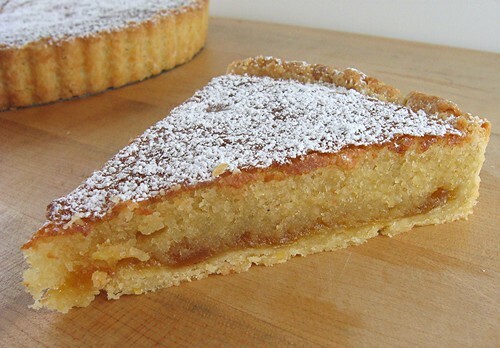 Secondly, I wanted to do a macadamia frangipane also, but was worried about the oil content in the mac. Now, I wish I did, and I would give anything to try your tart! It looks so delicious!! Great job!! That looks just lovely Mary! I like how you subbed Macadamia for the almonds and cream for the water. I can imagine how delish your tart would have been! This was a really fun challenge! I used mango jam too, and added some cardamom as well! Love your pictures, and very well defined slices. Your tart is beautiful and looks perfect! I love your choice of filling! thanks so very much for popping by! A beautiful smooth tart. I just love your use of macadamia and mango. Mango and macadamia- fabulous idea. Your tarts look amazing. I love your combination of macadamia nut frangipane and mango jam- fantastic pairing. The inside looks moist and so delicious! Your tart looks so beautiful! I love the mango filling you used. And using macadamia nuts was a brilliant idea! What a great combination of flavors! Simply heavenly! Your tart looks so professionally done. I love the clean-cut slice and presentation. Great work! Low fat baking is overrated :) I like how tropical your flavors are - and it's absolutely gorgeous! Lovely tart! It looks so delicous! Macadamia nuts are a wonderful twist! Great job on this month’s challenge. This is beautiful! I tried to get my parents to say they wanted a different nut but my mom said "I like almost" so I stuck with those. Yours looks so moist and yummy! What a perfect looking tart! I love how it's so simple yet so beautifully presented. Saw your tart at the forum. Engineered to perfection. I love how well it holds up. It's beautiful Mary! What a great idea, substituting macadamias for almonds! I love nuts of all kinds, but macadamias have a special place in my heart! Lovely tart, I'm sure it tasted fabulous! The almond didn't appeal to me but macadamia nuts, now that appeals! Ooo! Your tart looks perfect =D. I love the mango and macadamia flavour combo, it looks delicious!! Decadent finger food and the perfect combo of tropical flavors...clever to use toasted macadamias for the filling! Just beautiful!! OH BOY! That looks fantastic. I can't wait to cut into mine tomorrow after looking how wonderful yours looks. how perfect htis looks! mary it looks so professional and using macadamia nuts - UNBEATABLE! I'm yours at the macadamia! Oh yeah! I must keep your macadamia and Meeta's cashew in my head for the time I do this again. No, I've made a note on my recipe for this, my brain is not to be trusted. You dare and you do, Mary! Lovely! Macadamia and mango? Sounds and looks great...very nice tart. Yummie! Great flavour combination. Beautifully photographed as well. Macadamia Nuts & Mangos are my favorite flavors! Your tart looks beautiful! I love your pictures! 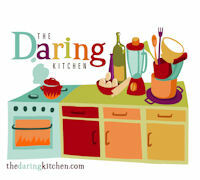 It's great to see an article about Cooking Perfect! I'm so glad to hear you are very perfect at it too, as that is difficult and even more so in this economy.